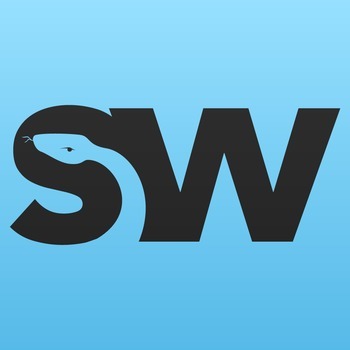 Thank you for checking out Snakeword. This new type of word puzzle where the answers change direction! This one is all about chemical elements from the pediodic table. Anyway, how do you play....? 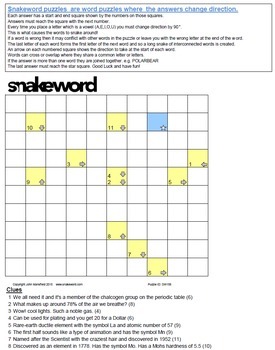 Snakeword is a new type of word puzzle where like a crossword you have clues to answer but unlike a crossword your answers change direction! Whenever you enter a vowel (A,E,I,O,U) your answer has to change direction. Answers have to reach from one numbered square to the next. The last letter of each word becomes the first letter of the next word and so a long snake of interconnected words is formed. Words can cross only if they share the same letter on that particular letter square. It is sometimes possible for a word to reach the next numbered square by taking the wrong path. This may interfere with the placement of future words. It is likely that there will be only one working solution.